San Diego, February 6, 2018 – “Lost Treasures of the Maya Snake Kings,” a new one-hour National Geographic special premiering today at 9/8 p.m. central, shows how LiDAR laser imaging technology is revolutionizing archaeology and features the WAVE data visualization technology created by researchers at the University of California San Diego Qualcomm Institute (QI). Albert Yu-Min Lin, an affiliate of QI, is the host of the program. The documentary explores what’s being hailed as a “major breakthrough” in Maya archaeology: the identification of ruins of more than 60,000 houses, palaces, elevated highways, and other human-made features that have been hidden for centuries under the jungles of northern Guatemala. The work was conducted by researchers of the PACUNAM LiDAR initiative. Using a powerful technology known as LiDAR (short for “Light Detection And Ranging”), scholars digitally removed the tree canopy from aerial images of the now-unpopulated landscape, revealing the ruins of a sprawling pre-Columbian civilization that was far more complex and interconnected than most Maya specialists had supposed. Working closely with National Geographic Explorers, QI’s Cultural Heritage Engineering Initiative (CHEI) was launched in 2007 and has since created a comprehensive toolbox and talent pool that brings the power of student-driven science and engineering to the study and preservation of archaeological sites, monuments, historic structures and other artifacts. QI researchers have a history of working on various ground based and drone based LiDAR imaging projects in Guatemala. Lin, along with his collaborators in the QI Engineers for Exploration program —co-directors Ryan Kastner and Curt Schurgers — collaborated with Garrison to lead teams of students on expeditions over the past four years to the jungles of Guatemala to test out various platforms for mapping and imaging. QI Staff Engineer Eric Lo and Ph.D. student Dominique Meyer were also instrumental in these field expeditions. 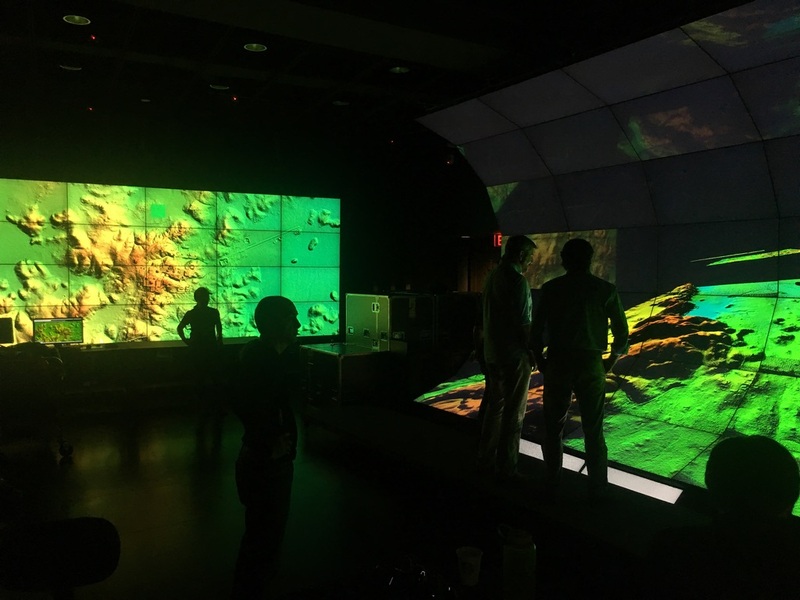 Researchers examine LiDAR imagery from Guatemala on two of the visualization displays (including the WAVE, at right) in the lab of the QI Cultural Heritage Engineering Initiative. The PACUNAM project mapped more than 800 square miles (2,100 square kilometers) of the Maya Biosphere Reserve in the Petén region of Guatemala, producing the largest LiDAR data set ever obtained for archaeological research. Virtually all the Maya cities were connected by causeways wide enough to suggest that they were heavily trafficked and used for trade and other forms of regional interaction. These highways were elevated to allow easy passage even during rainy seasons. In a part of the world where there is usually too much or too little precipitation, the flow of water was meticulously planned and controlled via canals, dikes, and reservoirs. “The ambition and the impact of this project is just incredible,” said Kathryn Reese-Taylor, a University of Calgary archaeologist and Maya specialist who was not associated with the PACUNAM survey. “After decades of combing through the forests, no archaeologists had stumbled across these sites. More importantly, we never had the big picture that this data set gives us. It really pulls back the veil and helps us see the civilization as the ancient Maya saw it.